Experiment with the creative possibilities of art. We will consider our own identities, using the idea of, and by creating, a new URBAN TRIBE. With the support of OSIC Oficina de Suport a la Iniciativa Cultural del Departament de Cultura de la Generalitat de Catalunya. We will consider our own identities, using the idea of, and by creating, a new URBAN TRIBE. We will learn about contemporary artists who have explored issues such as the body, the group and the representation of the other, in order to develop an artistic project. 1st Session – Monday 9th July – What are we like? Description and self-portrait. We will try to explain what we are like, using different artistic dynamics and techniques. Humans are social individuals, we organise ourselves in cohesive groups such as groups of friends, football teams, classrooms, families, a people, and nations, among many other collective identities. Clothes, colours, tattoos, ornaments and jewellery, make-up ... What marks the identity of a group? Art can be a tool to interpret different characters. Through costumes and masks, using theatre and the performing arts, we may make a physical representation of the other. 4th & 5th Sessions – Thursday 12th & Friday 13th July - Art Project : Urban Tribes. In groups, we will create a new urban tribe. What will be our hobbies, our habits, in short, our culture? And how will this culture influence our external appearance? What elements will identify us? 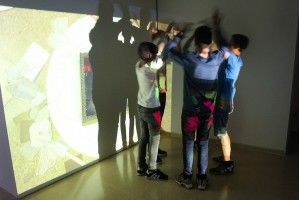 30 € (24 € for Amics d’ACVic and members of H. Associació per a les Arts Contemporànies). Reservations will end on Tuesday 3rd July, and can be made by using the application form on the ACVic website, or by calling 93 885 37 04. Please note that there is a limited number of places, and that these will be allocated on a strict first come, first served basis. We would suggest that participants bring along something to eat for breakfast, and clothes for making a mess in. Some activities will take place outside, around and near ACVic. Bruna Dinarès and Carles Arumí, members of ACVic's team.